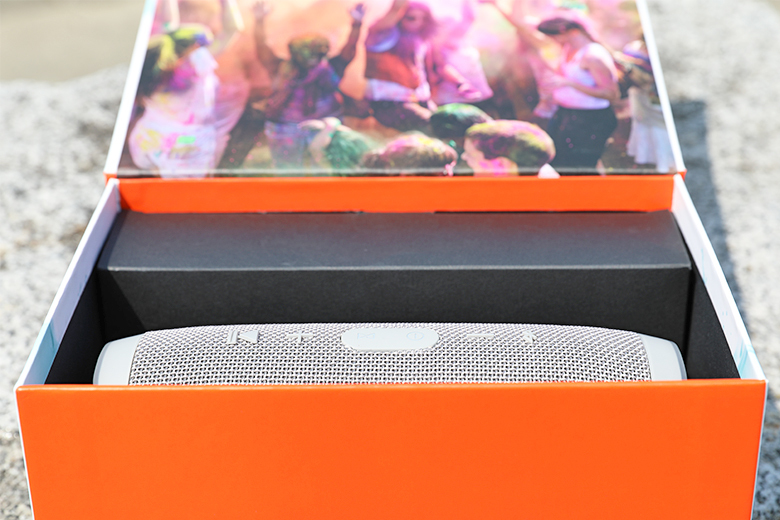 Yes, we're reviewing another wireless speaker. And before our diehard fans start throwing rotten tomatoes and accusing us of brainwash, we'll tell you why. Sit back down in your chair and be prepared to read about one of the most popular speakers on the market, not for its sound, but for its usability. 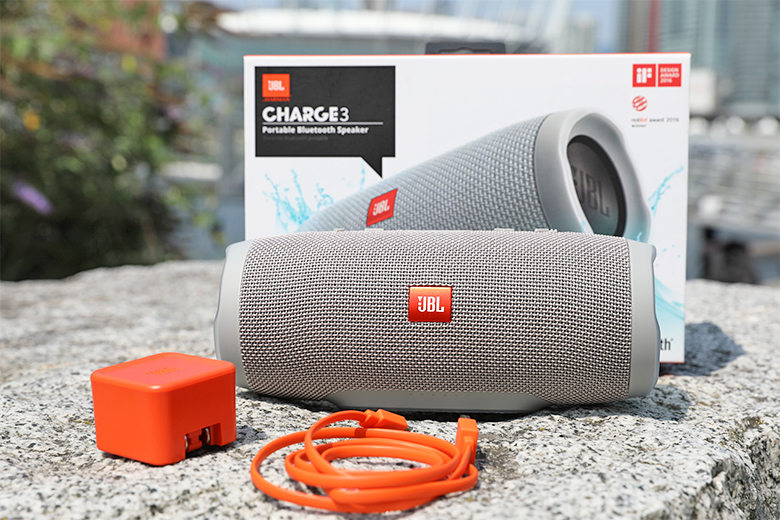 Meet the waterproof-wonder, the speaker you won't fear to take hiking or throw in the ocean - trust us, we tried it - the JBL Charge 3. In this review, we'll explore the Charge 3's sound, design, packaging and accessories, specs, and more. For alternative options, see our list of the best wireless speakers. 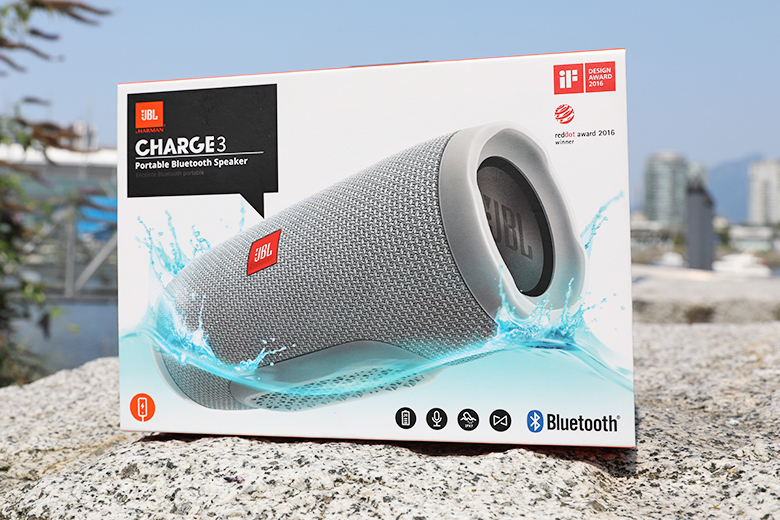 The JBL Charge 3 isn't the greatest-sounding speaker in the world, but it's really not half bad for a waterproof speaker. We'll talk more about how waterproofing can affect the sound in a bit. If you don't mind sacrificing a little audio quality for convenience, the Charge 3 is a perfect option for someone looking for decent sound at an affordable price, and in a portable package. The Charge 3 is a bright speaker, which means that it tends to be a bit heavy in the treble range. Instruments like strings, sound effects, and some vocals can come across a bit harsh at higher volumes, but are perfectly acceptable when playing at moderate levels. The mid-range is fairly clear, and happens to be one of the better parts of the sound, but the lower-mids tend to get slightly muddy when there's a lot going on in the song. This has more to do with the capabilities of the drivers to separate tracks and create a proper soundstage, as well as how accurately they can represent each individual sound. No, it's not as accurate as something like the RIVA Arena, but with the price difference - $249 to $136 - along with the waterproofing, we don't expect it to be. The bass is where the Charge 3 doesn't disappoint. 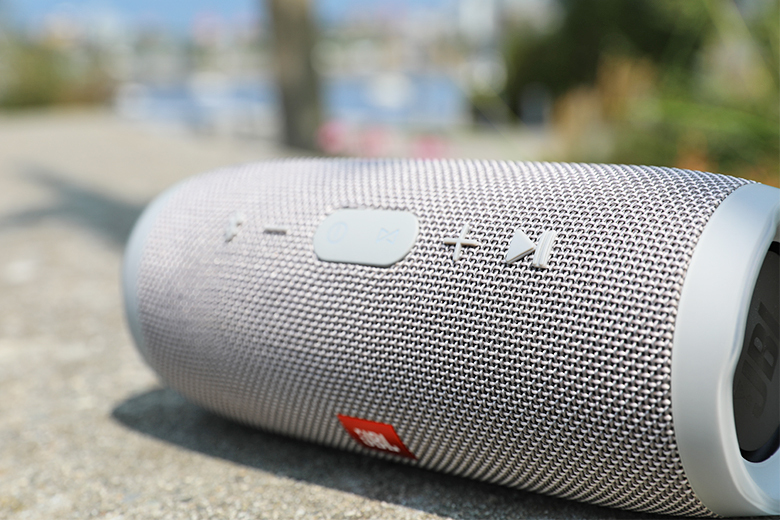 For such a small package, this speaker manages to pack in a solid amount of low-end. It's something that a lot of people would choose this speaker for over others, especially considering its price-point. For $136, you can have a portable party speaker, that pumps up your favorite hip hop tracks with ease. 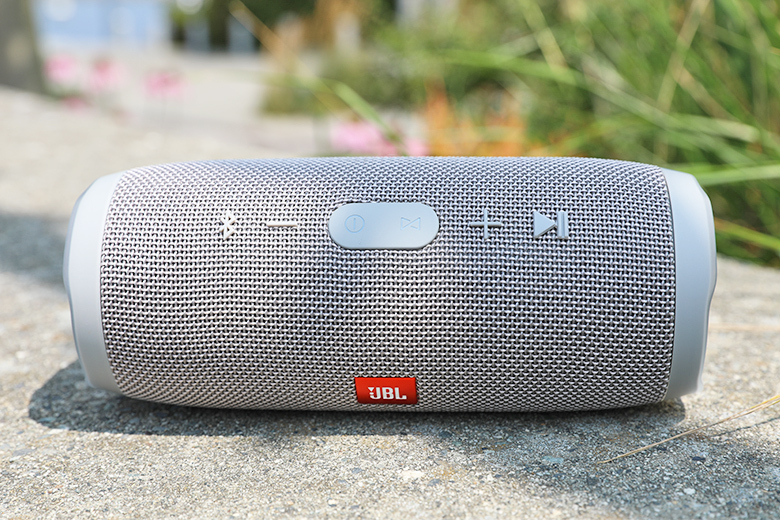 We preferred the Charge 3's bass over that of the JBL Flip 4 (full review here) - it's a smaller speaker, but one that's often compared to the Charge 3 for its portability. Power-wise, the Charge 3 is impressive. With two 10-watt drivers, it can get much louder than you'd expect. We've seen this speaker fill a full studio apartment with extra room - something other wireless speakers, like the Google Home (full review here), can't quite pull off. And in terms of power, the Charge 3 trumps the smaller JBL Flip 4 and UE Roll 2, but it does have one slight downside. When pushed to max volume, the speaker starts to distort in the higher frequencies. It's something we mentioned previously, and think it's worth noting again. It's not a huge issue, but we recommend listening at a lower level, if you want to avoid it. This is common for waterproof speakers, as the casing used to proof a device can limit its overall abilities, like sound and power.This isn't necessarily a bad thing, but something to consider when choosing a waterproof speaker over others. You can still enjoy the thrill of watching the drivers pulse on either side of the speaker, but it's nothing like witnessing a subwoofer move air like a damn cannon. The Charge 3 is a solidly-built speaker - perhaps one of the more robust speakers we've tested. You certainly won't be concerned about dropping this thing, or getting it dirty. It's not a tank like the Soundcast VG1, listed at $135, but it'll get the job done in terms of durability. The two 50mm drivers are located on opposite ends of the speaker, like a musical pool floaty, and the rest of the tech is encased within the middle. The casing of the cylinder is a thick, fabric-rubber hybrid that is surprisingly soft to the touch. The Charge 3 comes in multiple color options, but we chose the white/grey one. It looks decent, but we could see this speaker getting dirty, quick. The controls for the Charge 3 are located on the top of the speaker, raised in rubber, and singularly depressible. Here, you'll find controls for power, Bluetooth pairing mode, volume up/down, and pause/play. Simple and without need to look at the manual - not rocket science, like navigating the modes of the RIVA Festival (full review here). That speaker has more features than we can count, and with different color-coding for each one. We like the options, but the pair-and-play simplicity of the Charge 3 is great for on-the-go listening. The battery life indicator is on the front of the speaker on the bottom rubber footing which stands out about an inch from the speaker. Cute lights let you know the battery life the speaker has left, and when it's in need of charging, and serve as a volume indicator. 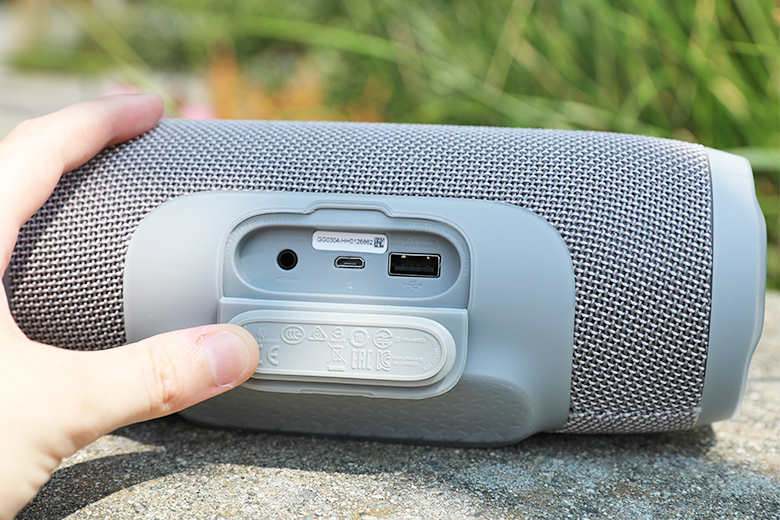 On the back of the speaker, you'll find the micro-USB charging-in and USB charging-out ports, as well as the 3.5mm auxiliary connection. These can be used to charge the speaker, charge your phone, or play music via wired connection. They are protected by a waterproof flap - so make sure you seal this shut before tossing the speaker in the pool. Speaking of waterproofing: the Charge 3 is IPX7-rated, which means it can be submerged in just under three and a half feet of water for up to 30 minutes. If you want to learn more about IP ratings, you can read this chart. We're certain they'll do a far better job of explaining it to you, but if you just want to know the basics, simply don't leave the speaker at the bottom of your pool for more than half an hour. You can take this speaker to the beach, the pool, heck, even use it in the shower. There's no need to worry about damaging it - so long as you keep the connection ports covered. As we mentioned before, the waterproofing can dampen the sound a bit compared to non-waterproof speakers, but it's a small price to pay for full durability. The Bluetooth connectivity of the Charge 3 is solid, and we didn't experience dropouts during testing unless we actually removed ourselves from the room the speaker was in. This meant we could freely move throughout our testing space, put our phones in our pocket, leave them on counters across the room, all without issue. After our debacle with the Solis SO-7000 (full review here), we appreciate a solid connection, and rank Bluetooth speakers based on their ability to do exactly that. The JBL Connect function is used to pair speakers for multi-room listening. This is simple enough to use - just download the app, press the pairing button on both speakers, and they will automatically connect. 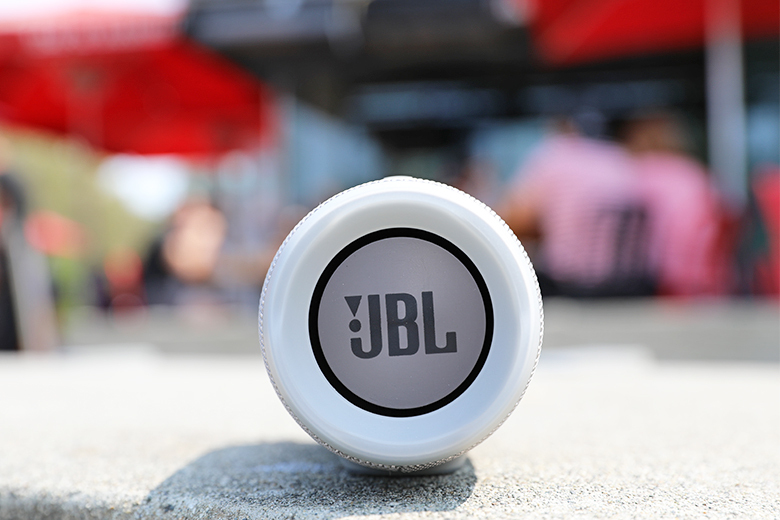 You can choose between using them as a stereo pair or designated speakers, and it works with any JBL Connect-compatible speaker. This includes the Flip 4, Flip 3, Charge 3, Pulse 3, Pulse 2, Xtreme 2, Xtreme, and Boombox. Some of the newer speakers - any released after 2017 - can be used with the JBL Connect+ function, which allows you to connect up to 100 speakers. Jaysus. A bit much if you ask us, and this is honestly where things get a bit complicated. Bear with us for a moment while we explain. JBL released an update for the Charge 3 that allows the listener to upgrade the firmware and make it compatible with the JBL Connect+ functionality. This lets the listener take full advantage of the hundred-speaker party mode. However, once you update your Charge 3, you can no longer connect to other regular JBL Connect speakers, nor can you enable stereo pairing. This means you won't be able to use older models with your Charge 3 once it's been updated, and lose one of the key features of the pairing mode. The battery life of the Charge 3 is solid, rated at 20 hours of playtime. We managed to squeeze roughly the full amount out of ours at moderate volume, and didn't really feel the need to charge it often. Using it for a few hours per day lasted us all week without much worry - better than what we could say for the UE Megaboom (full review here), which only lasted 15 hours at half volume. We'd recommend plugging the Charge 3 in every couple of days, however, because it takes up to four and a half hours to gain back a full charge. If you know you're going on a long road trip, or spending the weekend camping without power, charge it up before you go. Otherwise, you'll find that it can get you through the day - no problem! As we mentioned before, the handy battery indicator will let you know when it's in need of some juice. 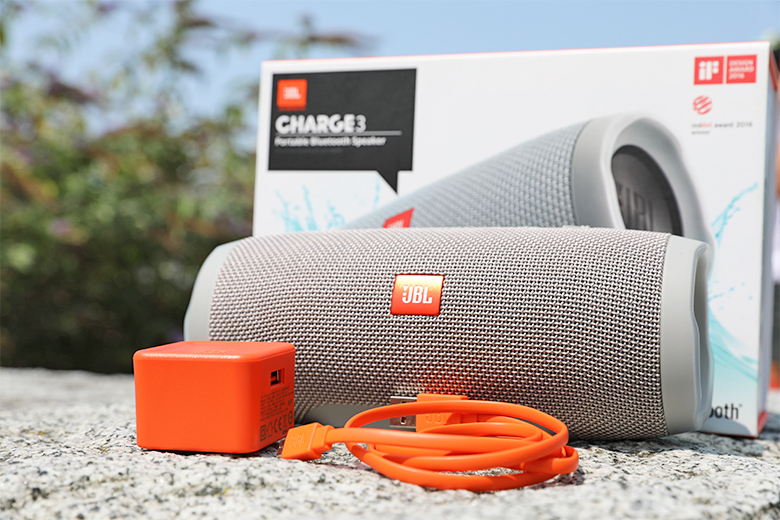 Since we first wrote this review, JBL has released an update to the Charge line - the JBL Charge 4. It costs less than the Charge 3 did at launch - currently, the Charge 4 is priced at $117. That's a good thing, because the differences are very minor. Sound quality and battery life are virtually identical, and the most important change is the move from micro-USB charging to USB-C - hooray! There's no longer a USB adaptor, however, although since most of us have one or two spare lying around, it's not a huge issue. The Charge 4 also comes in slightly more sober colors than the Charge 3; perhaps, like the audience for the Harry Potter movies, it's grown up a little. Kind of a shame, we think. All the same: you can get the Charge 4, and get many of the same features we've talked about in this review. The accessories are minimal, but equally as visually-jarring as the box. You get bright-orange charging block and cable, along with a standard manual. There's no aux cable, but fret not, for you will probably never lose the block, as it will light up even the darkest crevices of your car's floor. Try not to look directly at it - we don't think JBL's warranty covers blindness. 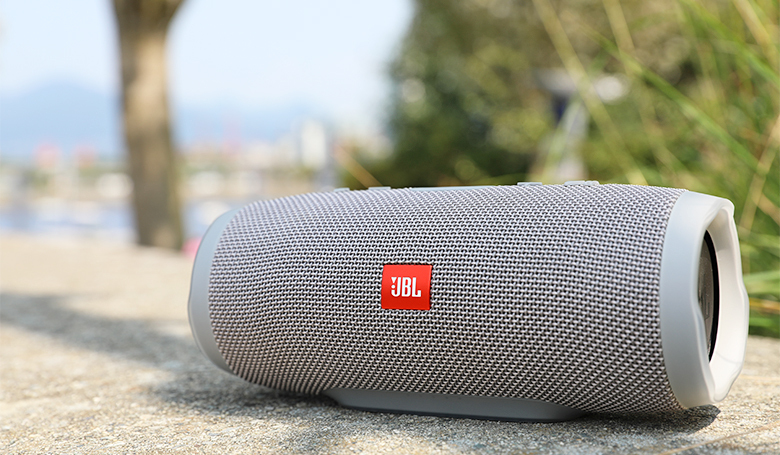 The JBL Charge 3 is portable, lightweight, and perfect for on-the-go listening. The Charge 3 is waterproof, and can withstand being fully submerged in shallow water for up to half an hour. The Charge 3 has great connectivity - better than some wireless speakers we've tested - and can be used for multi-room listening. The Charge 3 is affordable, and becoming less expensive as newer models are released. The Charge 3's sound isn't the best, and can distort at higher volumes. We would appreciate a shorter charging time - four and a half hours is pretty steep. The Charge 3 has to be updated to connect with newer JBL speakers, which raises technical issues and loss of some key functionality. If you want a good, solid alternative to the Charge 3, your first stop should be Ultimate Ears (UE) and their BOOM 3 speaker. 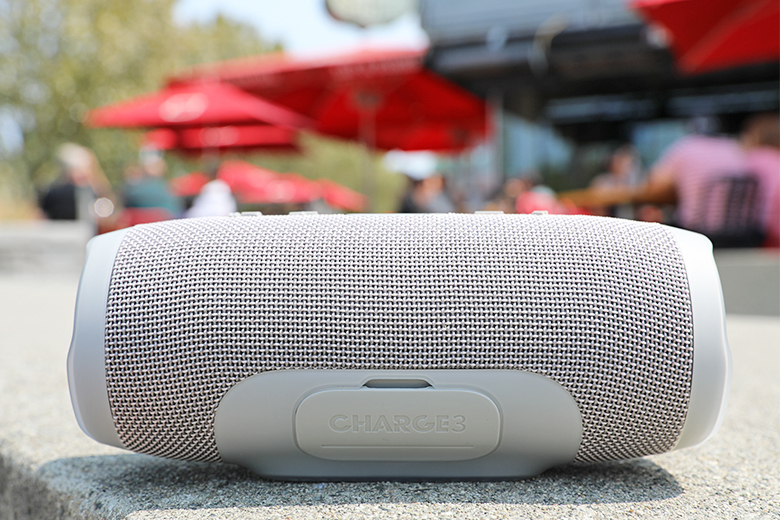 It's a $149 wireless speaker that we think offers better overall sound than the Charge 3 and Charge 4, and comes in a variety of bright, eye-catching colors. It also features 360* sound, as opposed to the Charge 3's stereo sound, and has a better tonal quality overall. The BOOM 3 weighs less than the Charge 3, and is a great alternative for someone looking for more portability with a decent sound. Though the BOOM 3 has lower battery life (15 Hours), it takes less time to charge, making this a toss-up between long-lasting power and convenient charging. Though we're more likely to side with JBL on this one for power, we'd suggest the BOOM 3 for a better listening experience. If you want something a little more sound-focussed, and aren't worried about portability, try the Sonos One (2nd Gen) smart speaker. It's more expensive than the Charge 3, at $179, but has significantly better audio quality - and comes with the added bonus of Amazon Alexa functionality. If you're willing to sacrifice portability and waterproofing, this should be your go-to pick. It's got a bit more power on the Charge 3, and the tonal representation is much more accurate. This is a speaker for someone, who wants the joys of wireless, multi-room listening, without giving up the intricacies of their tracks. If you're looking for a truly budget option, how about the Cambridge Soundworks Oontz Angle 3 Plus? 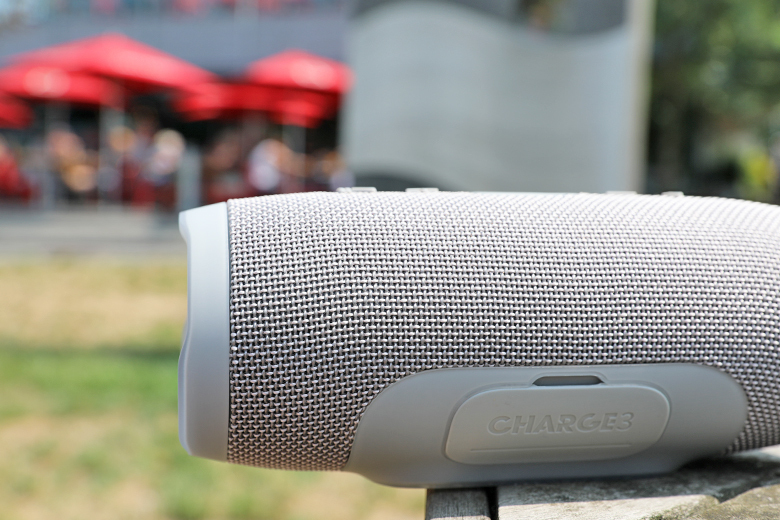 It's a $35 portable speaker, and while it certainly doesn't have the grunt or aural energy of the Charge 3 and Charge 4, it makes up for it thanks to its knockabout nature and friendly price. Plus, you get huge battery life - around 27 hours. 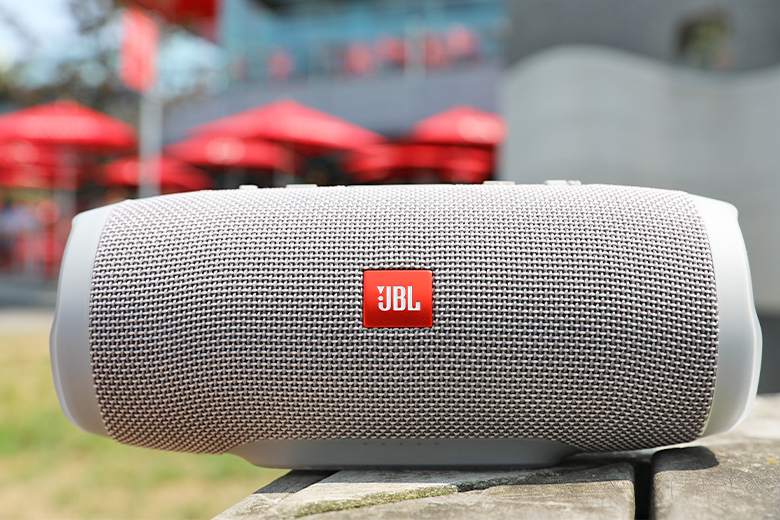 Our take: if you are prepared to spend a little more money, get the JBL, as it's an unquestionably superior speaker. But if you're on a budget, then the Cambridge Soundworks Oontz Angle 3 Plus will perform well as a basic wireless speaker. 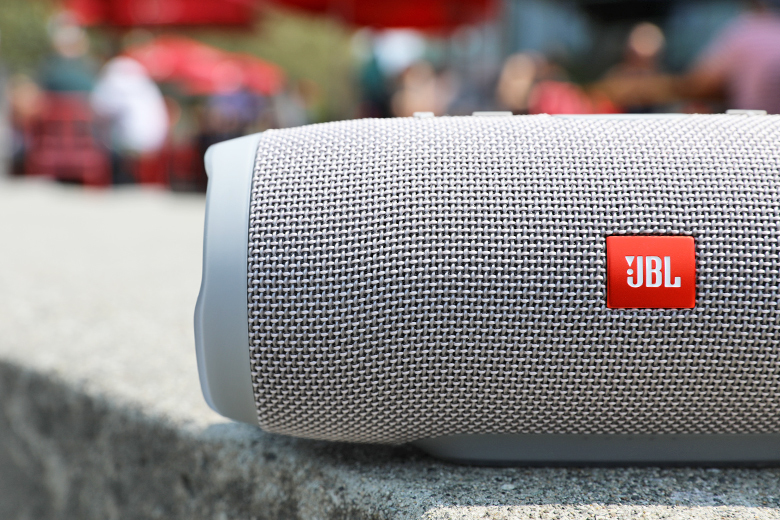 The JBL Flip 4 is a portable, handheld, Bluetooth speaker, and the little brother to the Charge 3. It's compact, lightweight, and designed to take on any road trip you throw at it. It has the same waterproof rating as the Charge 3, and even comes with a wrist strap for use in the pool or on-the-go listening. The battery is rated to last 12 hours of playtime, but most listeners reported between four and ten hours at max volume - roughly half of what we got with our Charge 3. The connectivity is decent, like the Charge 3, and it can get loud enough to fill a smaller space, but we certainly didn't expect it to perform like the larger model. 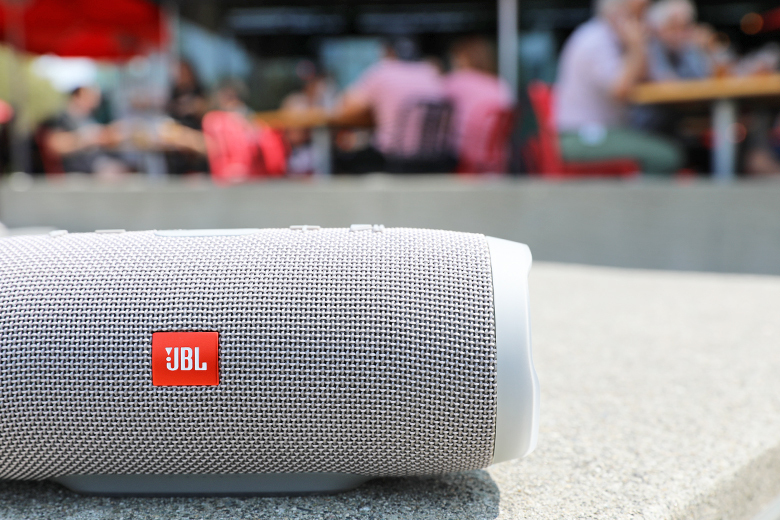 If you're looking for a standard JBL speaker in a smaller package, the Flip 4 is your best option. 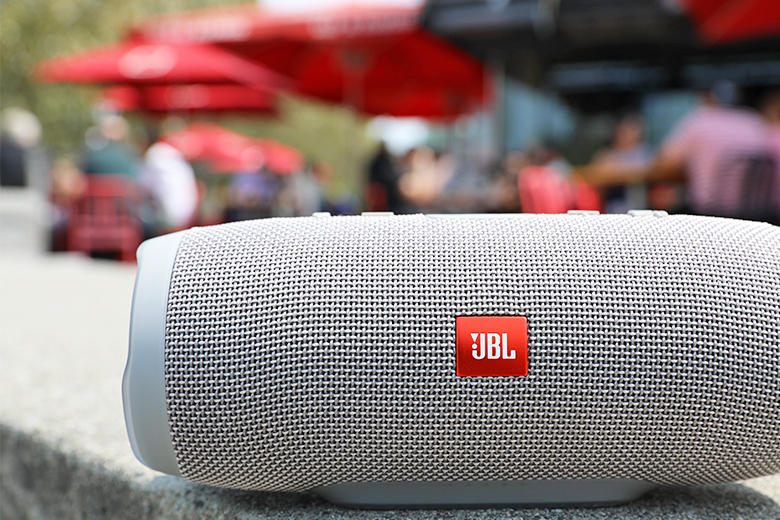 It can be had for a cool $86, making it a great budget option for JBL fans. But with the reduced battery life and sound quality, we'd honestly suggest just getting the Charge 3.